Happy New Year and welcome to the Bayport Times. This issue featuring a look at The Clue Of The Screeching Owl, new collectible discoveries, letters and more! Even though the Casefiles series has been discontinued in the USA, it's still going strong in Great Britain. Many of the books have different artwork than the US versions and, in one case, a different title! I've signed on as an Amazon.UK Asscociate and now you can order British Casefiles directly from my Amazon Sales Page. 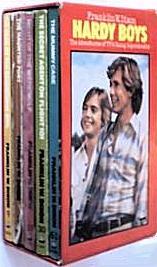 Please note that both The Bayport Times and The Unofficial Hardy Boys Home Page are made possible by your purchases from my Amazon.com page, so the best way to show your support is to utilize my Amazon.com page as much as possible, even when buying non-Hardy Boys related books, videos, etc. by using the Search Boxes - THANKS! Books Make Great Gifts! It's easy to join too! If you are a Yahoo members just go to http://groups.yahoo.com/group/HardyBoys and click on Join This Group. Non-Yahoo members (and Yahoo members too!) can subscribe simply by sending an e-mail to hardyboys-subscribe@yahoogroups.com. Applewood DJ's Lacking Gold Seal Applewood printed a limited amount of covers lacking the "Just As You Remember Them" gold seal on the front cover for volumes 1 thru 6. I have recently finished reading The Clue of the Screeching Owl at work (during lunch and breaks). This re-reading confirmed my belief that not all the good Hardy Boy books were written early on. 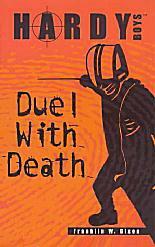 This book is one of the better books and was released during the height of my Hardy Boy reading (1962-1968). The first thing that attracted me to this book was the incredible artwork on this 4th "Picture Cover" (PC) edition. For the most part, I did not like those PC's (especially starting with Whale Tattoo and Arctic Patrol ) that showed a single dominating thing or character with smaller add-ons to flesh the picture out. I'm not really sure that I explained precisely what I meant, that is one of my shortcomings in posting. Anyway, I think this cover does an incredible job of capturing the "feel" of Black Hollow and environs. The dominating "thing" in this case is the head of a screech owl looking down with brooding menace on the Hardy Boys as they gaze backwards in fear while fleeing its baleful stare. The owls visage takes up half the night sky and the dark woods of Black Hollow are an effective backdrop between it and the terrified brothers. While it is true that this is not an actual scene from the book, it does intrigue a prospective reader and in no manner misrepresents the story line or its atmosphere. The story itself opens with Frank, Joe, and Chet driving through the Amish countryside, en route to the Pocono Mountains. There they plan to meet up with one of Fenton's old friends, retired police Captain Thomas McGuire. He lives in a cabin at the edge of Black Hollow. The name itself fascinates me. How much more sinister the word "hollow" is, compared to say, "valley". The captain was concerned about the revival of a witches hex in the hollow, abetted by the tell-tale abduction of neighborhood dogs and the terrifying screams of the vengeance seeking witch herself. Fenton Hardy could not respond to his friends request for help as he was busy on another (was it another) case, in nearby New Jersey, involving smugglers. . The last book I read in this series was smuggler related too ("The House on the Cliff", a comparison of the original and revised versions). What was slightly unusual here is that the boy's father does not inform them in person of his latest case. The Hardy's reflect back on this as the story begins. The 3 youths arrive to find the captain's cabin empty and under mysterious circumstances (what other kind are there )? Of course meeting Colonel Thunder the wildcat trainer en route (pages 7 & 8), adds a teaser to the plot. Not only is the good captain missing, but so is Bobby Thompson's dog, "Skippy". So down into Black Hollow go our three intrepid sleuths. I kept track of the number of trips made down into the dark bowels of Black Hollow : First : chapter 2 Second : chapters 3 & 4 Third : chapters 7 - 9 Fourth : chapters 13 & 14 Fifth : chapters 17 & 18 Sixth : chapters 18 & 19 I divided the story into two parts : those in or at the edge of Black Hollow and those parts elsewhere (like stranded in their underwear at the outskirts of town). When down in the hollow, one feels like they are detached from the real world and entered into a realm bordering on fantasy. At least I do. I mean there is even a wildcat on the loose and a wild boy. Shades of Bomba! The only mention of The Hardys' previous cases is when Joe mentions "The Desert Giant Mystery" (page 17). Getting off topic for a moment, I remember buying that book at the local 5 & 10 store, crossing the square to a place where one could race motorized model cars, and sat in one of the chairs provided for those who like to watch such goings on (like me). I stayed the entire afternoon, hardly lifting my engrossed head, and read the entire book. It is one of those memories that I have carried and wish I could somehow recapture the magic of such moments. Alas ... The various screams heard within Black Hollow bear some scrutiny. They are heard in variation on pages 19, 116, and 138 (maybe once or twice more). Some are said to be barn owls, screech owls, witches, wildcats, or human. As it turns out, the smugglers were utilizing the scream or wail of the two owls as signals, in their smuggling operation. There was a scream of a puma (not really wild, but sold to Walter Donner by his brother Bill, the wildcat trainer). It was too vicious for the carnival act. Bill Donner calls himself Colonel Bill Thunder. When Frank and Joe realize that "donner" was the German word for "thunder", and saw that both Bill and Walter looked identical, they put two and two together and deduced they were brothers (page 90). I guess when I was 8 years old that kind of deductive reasoning struck me as pretty inventive. I'm afraid that at the ripe old age of 45, I think it excessively silly. That along with overhearing Walter Donner and the shifty-eyed lawyer, Wyckoff Webber talk about "attending to the boys" (page 114) and wondering if they were the boys being discussed. Those two incidents are the only negatives I saw in this book. In retrospect, that's a drop in the bucket, but I thought worth bringing up. I didn't want you all to think that everything is rosy to me. I do have a discerning eye . I was surprised that it was Joe who figures out that the Witch of Black Hollow legend was being revived for nefarious reasons (page 37). Usually Frank is the brains of this tandem. One of the most horrifying scenes from this book is when The Hardys believe Chet is dead (pages 167 & 168), in a car crash on the edge of Black Hollow. The calamitous reactions to this news is starkly evidenced on their faces and in their minds. I disagree with Joe's remark that the Barn Owl is the natural enemy of puppies (page 57). While it is certainly capable of making a meal from small pets or puppies, I don't believe they are a part of its steady diet. That minor disagreement is more than made up with the follow-up discussion of the differences between Barn and Screech Owls. Very informative. On page 126 Frank retrieves "a bill" from its hiding place in the car, to be utilized in an emergency. This certainly was, as Captain McGuire's cabin had just burned down and the 3 youths had barely escaped with their lives. This "bill" was used to procure new clothes and lasted them until the end of the adventure. Wyckoff Webber set the fire by the way. I was wondering exactly what denomination that "bill" was. Captain McGuire finally appears on page 159. 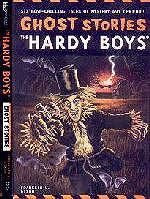 The title is used on page 162 and Fenton Hardy puts in his inevitable appearance on page 174. In typical Hardy fashion, the two cases are solved as one and all questions are answered. Even the puma is saved from destruction! The wild boy gets a chance at a normal life and Bobby gets Skippy back. I hope Elizabeth Donner doesn't put up too much of a fight about that. Oh yeah, I hope Captain McGuire had fire insurance! On a scale of one to ten, with ten being the best, I rate The Clue of the Screeching Owl a rock solid 8.5! What do you think? You can buy The Clue Of The Screeching Owl from Amazon.com. 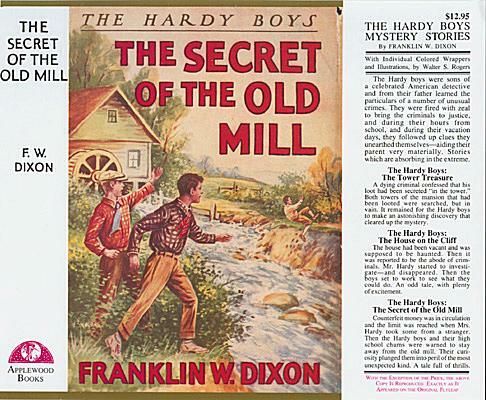 A loud ring of the doorbell startled the Hardy boys as they sat watching a TV mystery. "I wonder who that man is, Frank," whispered blond Joe Hardy, peering curiously from a second-floor window of their home. "He looks worried." When Frank Hardy answered the doorbell that morning, he had no idea that its shrill ringing was a summons to excitement, adventure, and peril. "Telegram for Frank and Joe Hardy!" The messenger gave an envelope to the seventeen-year-old, blond haired boy who answered the door at the Hardys’ home in Bayport. "Extra! Extra! ‘Bayport Faces Water Shortage’! Read all-l about-t it!" "Why, what’s the matter, Frank?" exclaimed Joe Hardy as his elder brother suddenly stopped walking and began to search his pockets frantically. "What an odd letter!" exclaimed Frank Hardy, running a hand through his dark hair. "I wonder what the man wants." "What do you mean, we can’t go swimming?" asked Joe Hardy. The shrill ringing of the Hardy telephone greeted Frank and Joe. The telephone in the Hardy home rang sharply as the clock struck four. "I want to speak to Frank and Joe Hardy at once," said an excited voice on the telephone. "It’s urgent." "Frank, come here!" Joe Hardy called excitedly to his brother. "Joe, how soon will you be ready to roll?" "Too bad we lost so much time fixing that flat, Joe. Dad wanted us home in a hurry to start work on a case." "Wonder what mystery Dad’s working on now?" Joe Hardy asked. "After the help we gave dad on that forgery case I guess he’ll begin to think we could be detectives when we grow up." Frank and Joe Hardy followed their father into the law office of Otis Weaver, a Bayport attorney. "Dad, why did you want us fellows here for a meeting tonight?" asked blond, seventeen-year-old Joe Hardy. "Boys, I’m on a new case and I’ve run into a problem," Fenton Hardy said. "Do you boys feel up to tackling a counterfeit ring case?" Detective Fenton Hardy asked his sons. Joe Hardy studied the photograph in his hand and frowned, then burst out laughing. "How would you boys like to fly to Iceland?" Mr. Hardy asked his sons. "What an assignment! And from our own Dad!" "So you boys want to help me on another case?" Fenton Hardy, internationally known detective, smiled at his teenage sons. Frank Hardy turned the controls of a stereo set. "I’ll see if I can find some country music, Joe," he said to his brother. As the giant jet hissed toward London, Joe Hardy looked out the window at the flaming sunrise. "There’s one thing I will say for Mexican history," said Frank Hardy as he put aside the book he was reading, "it isn’t dull." "Can you tell a Greek by looking at him?" asked Joe Hardy. "Don’t kid me, fellows," chubby Chet Morton said. "Let’s see if you can get us down in one piece, Frank!" "Don’t forget, Frank, any treasure we find will be divided fifty-fifty!" Blond, seventeen-year-old Joe Hardy grinned. Skating against the stiff evening wind, Frank and Joe Hardy streaked across the frozen surface of Willow River toward Woodson Academy. The Sleuth roared toward Barmet Bay as fast as its propeller could churn the sullen sea. "When do you think this mysterious visitor is going to show up?" Chet Morton asked impatiently. "Look! A periscope!" Joe Hardy shouted. "Joe, look out! That launch will hit you!" shouted Frank Hardy. "Better head for shore, Frank! It’s blowing up a gale!" "It’s certainly great to have an airport so close to Barmet Bay," said Frank Hardy. "The invention of the age!" proclaimed Chet Morton. "Do you see what I see?" Joe Hardy asked his brother. Loud explosions, like a fusillade of gunfire, echoed through the quiet streets of Bayport. "How can the hand be quicker than the eye?" asked Chet Morton. "It certainly is a mystery how those autos disappeared," said Frank Hardy. "It’s a mystery to me," said Joe Hardy. The Hardy boys’ convertible, heading for the open country, whizzed past a road sign inscribed Bayport City Limits. "STOP!" Eighteen-year-old Frank Hardy jammed on the car breaks. "Wow! That fellow sure was in a hurry to get past us!" exclaimed Joe Hardy. "Somebody’s going to get hurt!" Frank Hardy exclaimed. "Hey, Frank! Isn’t that the black car Dad told us to watch for?" exclaimed Joe Hardy. "Checkmate!" said Frank Hardy as he glanced across the chessboard at his brother Joe. "Summer vacation!" Chet Morton exclaimed. "No more school until September." It was late Sunday morning. "What a reward!" Joe Hardy exclaimed. "You mean we can stay at Cabin Island over the winter vacation?" "I’m glad there is peace and quiet in the air this morning," said Mrs. Hardy, stirring her coffee. This is one terrific website! The newsletter is a joy to read. My comments concern thoughts after reading some of the postings, specifically the names tossed about for some of the books ("Hardy boys titles that never were" in issue 31). I've always been bothered by (original, unrevised) "The Secret panel" in that it does not really seem like a Hardy Boys book. I've always had the feeling that this was a nothing but a Nancy Drew story rewritten or written using the Hardy Boys format. 2. Story takes place around Bayport, as most of the surrounding novels do not. 4. The author of the tome is supposedly Harriet Stratemeyer. Since she often took credit for work that was not hers and at least on one occasion I did see a credit that Mildred Wirt may have written this volume, could it be that it's just not the writing style that different in this novel but the whole genesis of the story? Am I really off base here? Many others may have not read both the HB and N. Drew stories, though. Let's say the either Dana Girls or N. Drew this book seems like a Mildred Wirt authored book and that was this apparent to me even many years ago. P.S. My first HB book was "The Disappearing Floor" followed by the "Mystery of the Flying Express". Both titles were some of the last of the wrap spine editions c.1960. Now was I lucky (Ha!) or what? As a 6 year old with above average comprehension, I still had a hard time following these novels. But y'know, I was hooked. Here are some letters I've received from Larry Donaho - noted extravagant bidder on Hardy Boys items. What's your problem now? Not enough prozac? Don't send me any more emails. The next time that we have this conversation Drastic measures that you could not even imagine will commence. This is my last communication with you. Don't ever mention my name again on any of your sites. There is not one person who posts to your site or that has ever done business with you that has had any thing nice to say about you(not that you would care). I don't like your ways of doing business and I really Don't ever want to be associated with your group or hear from you again in any way at all. Wake up and look around you. It would totally amaze you as to the things that are going on that you have NO clue about. It was ok to post to your site days back when you wanted to know about where my books go etc. You were about the only one in the Hardy world that did not already know. All of the people that go to your site could care less about the books that you sell there. Not a single one of the 300+ members who have been members for over 6 months would buy anything from you. Do yourself a real favor and quit while you are ahead. Nobody cares about the so called work that you do there. Go get a paying job that will keep your mind of your insecurities and low self esteem. Now, As I said, Never contact me again in any way. By not answering this mail I will take it that you understand. Capish?